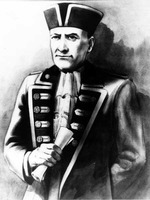 McDONELL (Collachie), ALEXANDER, army and militia officer, office holder, politician, and land agent; b. 16 April 1762 in Fort Augustus, Scotland, second son of Allan McDonell of Collachie and Helen MacNab; brother of Angus*; m. early 1805 Anne Smith, sister of Samuel Smith*, in York (Toronto), Upper Canada, and they had five sons, including Allan Macdonell*, and two daughters; d. 18 March 1842 in Toronto. Like other tacksmen families in the Highlands of Scotland, especially those of Roman Catholic persuasion, the McDonells of Collachie were by the 1770s under extreme economic pressure from their clan chieftain, and decided to emigrate to North America. Accompanied by other families of MacDonalds and MacDonells, they arrived in New York in 1773, settling under the auspices of Sir William Johnson* in the heart of the Mohawk valley. When the American revolution broke out, Allan McDonell joined his kinsmen in supporting the crown, and he was imprisoned by the rebels in 1776. He remained in custody until 1779, when he escaped to the province of Quebec and became a loyalist pensioner. His son Alexander enlisted in 1776 as a volunteer in the 1st battalion of the Royal Highland Emigrants, serving in the campaigns in the middle states and in the occupation of Philadelphia. With the evacuation of that city he made his way to Quebec and received a lieutenant’s commission in Butler’s Rangers, leading several raiding parties down the Mohawk valley in the last years of the war. As a half-pay officer Alexander joined his family in Quebec and accompanied them to Kingston in 1790. 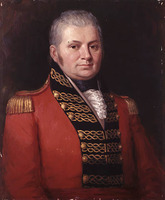 A wartime friendship with John Graves Simcoe* brought Alexander to Upper Canadian prominence in 1792 when Simcoe appointed him sheriff of the Home District; he transferred his residence to York in 1797. In 1793 he organized and accompanied an expedition under Simcoe to Lake Simcoe and Georgian Bay, his fluency in French, English, Gaelic, and Indian languages proving useful on this as on other occasions throughout his career. 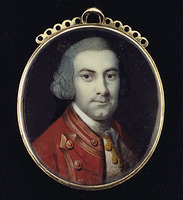 The favour which had been shown to McDonell in Upper Canada survived Simcoe’s departure in 1796, and in 1800 he was elected to the House of Assembly for Glengarry and Prescott; he would sit off and on in the house for over 20 years. Glengarry undoubtedly chose him to represent the Highland community because of his family connections and his residence at York. In the 1804 session he seconded an unsuccessful motion to change the name of York to Toronto, and he failed also to get majority support for a bill requiring schools in each district in the province. A surviving fragment of McDonell’s diary for 1799 indicates that he was an active member of the small bachelor élite in the tiny capital of York, dining in the mess, drinking tea and wine in great quantities, and playing whist in the evening. Early in 1800 he served as second to John Small* in the notorious duel in which Attorney General John White* was fatally wounded; a few years earlier he had himself been challenged to a duel by William Jarvis*. In 1804 McDonell was appointed agent of the Earl of Selkirk [Douglas*] in Upper Canada. Selkirk had met McDonell late in 1803 on his whirlwind tour of North America and had been impressed with him. The earl was always partial to Highland Catholics as subalterns, and McDonell’s political and social connections made him a particularly attractive choice to supervise Selkirk’s proposed settlement and private estate near Lake St Clair. Lieutenant Governor Peter Hunter* tried to warn Selkirk of McDonell’s weaknesses, but the advice went unheeded. Unfortunately, neither Baldoon, as the settlement became known, nor McDonell’s stewardship of it was successful. Selkirk and his agent had failed to appreciate the expense and difficulty of establishing a settlement in a wilderness area remote from communication and trade routes. Selkirk wanted his Highland settlers isolated from assimilating influences, and he was quite correct that the site he had selected was ideal for raising sheep, particularly because of adjacent marshlands. But the marshes bred malarial mosquitoes and the location was exposed to possible American depredations in time of war. What Selkirk needed, even before the death in September 1804 of his resident manager, William Burn*, was a dependable supervisor on the spot. McDonell, indeed, had agreed in June 1804 to move to nearby Sandwich (Windsor) and devote his full attention to Selkirk’s affairs. Required by Selkirk to surrender all offices, McDonell understood, his employer noted, “that in accepting my agency he would take to it as his permanent employment & that he relinquished every idea of applying personally or by friends for Govt. promotion.” Such commitments were soon forgotten. McDonell’s political obligations – he was speaker of the assembly from 1805 to 1807 – and his continued ambition for office combined with his marriage in 1805 to anchor him firmly at York, and he spent increasingly less time at the troubled settlement. Instead of a resident man of business, McDonell soon became an absentee paymaster, unable to control either expenditures or the restive Highlanders who had arrived at Baldoon in 1804. Although gaps in the accounts and the problems of currency conversion make it impossible to ascertain precisely how much Baldoon cost Selkirk, the figure was in excess of £10,000 sterling – and in the end he would have little to show for the outlay but thousands of acres of wilderness. In fairness to McDonell, it should be stated that he repeatedly warned Selkirk of the difficulties of the site and of the undertaking, but he also ignored specific instructions from his employer to remove the settlers to safer ground after the first malaria epidemic. A series of resident managers proved incapable of dealing with Baldoon’s many problems, even though Dr John Sims may have done a better job from 1807 to 1809 than McDonell allowed. As early as 1807 McDonell suggested to Selkirk that he would like to be relieved of his agency if a better appointment such as the provincial receiver generalship became available. Selkirk replied, “It has appeared to me for some time past that your avocations are now so multiple that it is impossible for you to devote your individual attention to my affairs as constant residence at Baldoon would require a sacrifice of other objects more important to yourself.” But better jobs did not come along, and McDonell found his agency more attractive just as Selkirk, appalled at the bills he was receiving, both for their magnitude and for the sloppiness of the accounting system, was moving to replace him. Over the years McDonell had repeatedly ignored Selkirk’s instructions and orders, as well as the pleas from Sims to provide a safer refuge for the nearly 1,000 breeding sheep on Selkirk’s home farm in the event of an American war. In the first days of conflict, Sims predicted, “some party on the other side will endeavour to obtain possession of the sheep at Baldoon,” a prescient anticipation of exactly what would finally destroy Selkirk’s venture in 1812. Selkirk in effect replaced McDonell with Thomas Clark* of Sandwich in 1809, but the damage had been done. Clark reported after examining the accounts that there was no fraud, only lack of proper attention to the business. Unlike fellow agent James Williams* on Prince Edward Island, McDonell did obey Selkirk’s summons to England to report in detail on his stewardship and accounts, departing Upper Canada on 29 June 1811 and returning in 1812 just in time to be appointed deputy paymaster general of the militia with the rank of colonel. He was captured by the Americans at Niagara (Niagara-on-the-Lake) in May 1813 and was incarcerated in the same prison in Lancaster, Pa, which a generation earlier had contained his father. Although he appears to have returned to York on parole by early 1814, he was not formally exchanged and able to resume his military duties until 25 May 1814. The loss of income was a serious blow. Following the close of the war, McDonell in July 1815 accepted the superintendency of the Perth settlement, a belated attempt by the British government to populate Upper Canada with potential soldiers by encouraging emigration from Scotland. He was extremely popular with the emigrants, perhaps because the largesse he showed was backed by government credit and because he resided in the settlement, however briefly. After settling the Perth people in the summer of 1816, McDonell was appointed assistant secretary of the Indian Department in Upper Canada and took up temporary residence at Niagara, where he complained constantly of the costs and disadvantages of living away from York. By 1818 he was building a substantial residence in York which was a social centre of the town for many years. The income to support this establishment and a large family came from his army pension, offices, and 10,000 acres of prime land he had acquired in the province, but he was perennially short of money and worried about his financial situation. Eventual appointment as inspector of licences for the Home District, a post he held from 1828 to 1841, was particularly lucrative and welcome. He was named to the Legislative Council in January 1831 and served faithfully until the council was abolished in February 1841, an unreconstructed member of the “family compact,” Roman Catholic branch. In 1835 he was made a director of the Bank of Upper Canada. Alexander McDonell was one of the most prominent members of his religious persuasion in York from his first residence there, and he was a lay leader of Catholics throughout most of his long life. 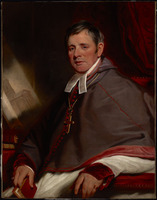 A close friend of his namesake Bishop Alexander McDonell, he assisted in the erection of St Paul’s Church in York in 1821, having from 1806 been one of the lay trustees of the Catholic church lot in the town. He served as treasurer of St Paul’s congregation in 1830, and he supported McDonell when the bishop suspended the Reverend William John O’Grady for resisting church authority. He also led York Catholics in periodic expressions of support for the government against the reformers in the 1830s, and was one of those who made possible the special position and privileges enjoyed by Catholics in an ostensibly Protestant province. McDonell’s career spanned the transition from loyalism to “family compact” in Upper Canada, and while offering some substantiation for those who would link the two, it also reminds us that neither was the monopoly of those who supported the Church of England. 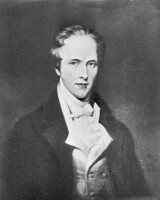 Like many of his kinsmen in North America, he was equally at home in the drawing-room or the wilderness, and throughout his life he lived in accordance with his mother’s early injunction “never to forget that all the blood in his veins was of a Highland gentleman.” Honour was of great importance to Alexander McDonell, and although some might occasionally question his judgement, none ever doubted his integrity. Two short journals kept by Alexander McDonell (Collachie) have been published: his “Diary of Gov. Simcoe’s journey from Humber Bay to Matchetache Bay, 1793” is in Canadian Institute, Trans. (Toronto), ser.4, 1 (1889–90): 128–39, and a fragment from a diary of 1799 appears as “A journal by Sheriff Alexander Macdonell …” in J. E. Middleton and Fred Landon, The province of Ontario: a history. 1615–1927 (5v., Toronto, [1927–28]), 2: 1246–50. Arch. of the Roman Catholic Archdiocese of Toronto, M (Macdonell papers), AB35, esp. 35.08. PAC, MG 19, E1, ser.1: 14540–55, 14601–4, 14843–45; MG 24, 18, 1–36. Corr. of Lieut. Governor Simcoe (Cruikshank), 4: 10–11. [Thomas Douglas, 5th Earl of] Selkirk, Lord Selkirk’s diary, 1803–1804; a journal of his travels in British North America and the northeastern United States, ed. P. C. T. White (Toronto, 1958; repr. New York, 1969), 147, 326, 341. Examiner (Toronto), 23 March 1842. Chadwick, Ontarian families, 1: 10–14. [A. J. Dooner, named] Brother Alfred, Catholic pioneers in Upper Canada (Toronto, 1947), 4, 7–9, 21–23, 25–31. I. C. C. Graham, Colonists from Scotland: emigration to North America. 1707–1783 (Ithaca, N.Y., 1956; repr. Port Washington, N.Y., and London, 1972), 81 et seq. Norman Macdonald, Canada, 1763–1841, immigration and settlement; the administration of the imperial land regulations (London and Toronto, 1939), 240–45. J. A. Macdonell, Sketches illustrating the early settlement and history of Glengarry in Canada, relating principally to the Revolutionary War of 1775–83, the War of 1812–14 and the rebellion of 1837–8 … (Montreal, 1893). A. E. D. MacKenzie, Baldoon: Lord Selkirk’s settlement in Upper Canada, ed. George Kerr (London, Ont., 1978). Hazel [Chisholm] Mathews, The mark of honour (Toronto. 1965), 37–40. W. L. Scott, “The Macdonells of Leek, Collachie and Aberchalder,” CCHA Report, 2 (1934–35): 22–32. J. M. Bumsted, “McDONELL (Collachie), ALEXANDER,” in Dictionary of Canadian Biography, vol. 7, University of Toronto/Université Laval, 2003–, accessed April 19, 2019, http://www.biographi.ca/en/bio/mcdonnell_alexander_7E.html.